Also called Creeping Vinca, Vinca Minor Periwinkle is most often grown as a groundcover. Its is an excellent choice for an erosion control specimen. This fast growing broadleaf evergreen plant grows easily and periwinkle care most often involves keeping the prolific spreader in check. Periwinkle, once established, is drought resistant and needs little other care if properly sited in the landscape. The periwinkle plant grows best in a partially shaded area in acidic soil; however, it can thrive in a variety of sunlight and soil conditions. Growing periwinkle in partial shade creates more vigorous growth. In many instances, extreme vigor may not be desirable unless the periwinkle plant needs to cover a large area. One small plant can spread to 8 feet across. 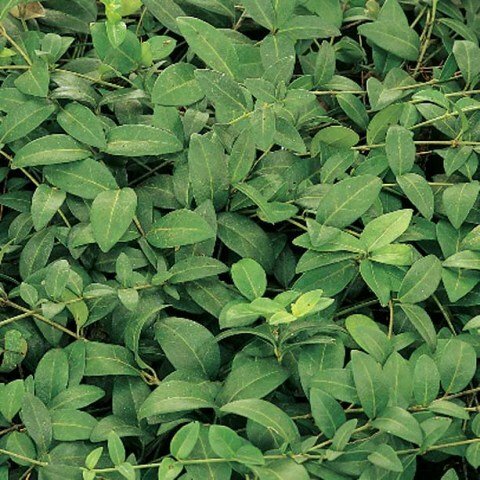 Details: An evergreen groundcover that makes a thick carpet of trailing stems. Blue, periwinkle flowers rise just above the deep green glossy foliage in spring. This is an excellent groundcover for shady areas of the landscape. Easily grown in average, dry to medium, well-drained soil in full sun to part shade. Tolerates full shade. Prefers moist, humusy soils in part shade. Plant 12-18" apart to cover large areas.